In this important article, Jason L. Brown, Ph.D., one of the most renowned and prolific dendrobatid frog researches of our time provides a comprehensive review of the science behind “Poison frog toxicity” and explains clearly and scientifically why these frogs are not dangerous nor toxic in captivity. Hobbyists are encouraged to link to this article and share freely. Central and South American poison dart frogs are widely touted as the most dangerous vertebrates on earth. In recent years, it would seem logical that many American states and Canadian provinces have begun to ban these purportedly dangerous critters from being household pets, correct? Actually, most of what is written or said regarding this topic on the internet is outright wrong or a gross misinterpretation of scientific facts. Given that this group of frogs is one of the best studied of all amphibians, scientists know a lot about these animals. This article is a summary of the key information relative to keeping these wonderful animals as pets and their potential risk to humans. Before I continue, let’s clarify the terms ‘poison’ and ‘venom’, as they are often erroneously used interchangeably. These words characterize the toxin delivery method. Poison is absorbed, or ingested, and venom is always actively injected. Wild amphibians use poison to defend themselves. Of over 175 species of poison dart frogs, only 3 are toxic enough to tip ‘darts’ for use by native peoples for hunting. These three species all belong to a small group of larger-sized poison frogs call Phyllobates (which is Greek for “leaf-walkers”). To the surprise of most people, only one of the three species has enough toxicity that a simple rub of a dart on the frog will result in enough toxin to kill small monkeys and birds. 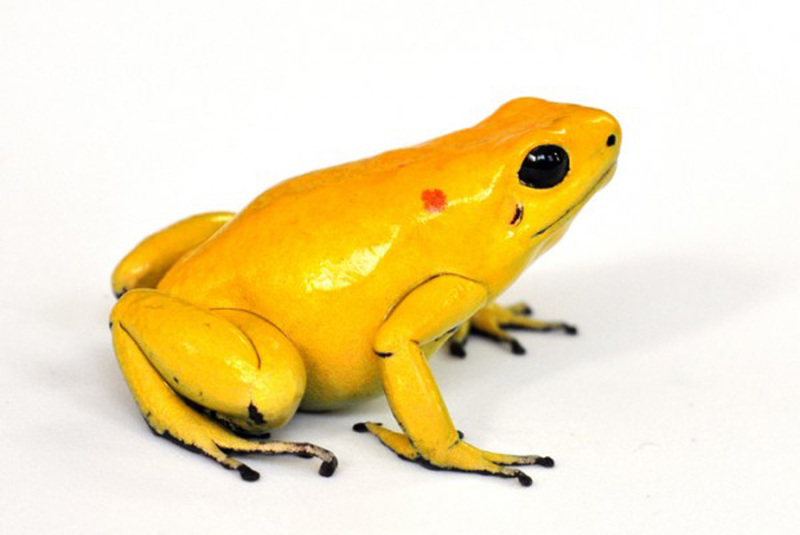 Meet the Golden Poison Frog, known as Phyllobates terribilis. For the toxin of the other two species to become useful on darts, the toxin needs to be more heavily concentrated. Unfortunately these frogs die in the extraction process, which is done by of roasting the animal over a flame to stimulate poison extrusion. Perhaps scientists who study ‘poison frogs’, like myself, are too excited to discuss this single super frog. In turn, we fail to clarify that the name poison dart frog is a gross misrepresentation of this large and amazing group of frogs. Three species (of 175) is hardly as fair representation of the other frogs in this group. All poison frogs belong to the family Dendrobatidae (often casually called ‘dendrobatid frogs’ by taxonomists). Many researchers and advocates, acknowledge the inaccuracy of the ‘poison dart-frog’ name and have begun calling them ‘poison frogs’ (appropriately leaving out the ‘dart’). However the name ‘poison frog’ is also misleading. Amphibians display a greater array of chemical defenses than any other group of vertebrates. All amphibians have glands in their skin that contain toxic secretions, including non-dendrobatid frogs found in your own backyard. The potency of these toxins is highly variable and ranges from foul tasting to potentially deadly. These toxins aid in avoiding predation, the most common benefit of this defense, and they also provide powerful antifungal and antibacterial properties1. Amphibian toxins even facilitate medical science; more than 200 chemical toxins beneficial in medical research have been isolated from just a small percentage of the world’s amphibian species, including dendrobatids. Thus, all frogs are truly ‘poison frogs’. Semantics aside, let’s examine the three ‘truly’ poisonous dart-frogs. Phyllobates terribilis, as its scientific name suggest, is a terribly toxic frog. It has enough of a very special kind of toxin in its skin, batrachotoxin, that the toxin from a single individual could potentially to kill upwards of 20,000 mice or up to 10 humans2. This is a frog that in the wild, should be avoided or handled with extreme care. The other two species of true ‘dart poison frogs’ are Phyllobates aurotaenia and Phyllobates bicolor. These two species are about 27 times less toxic than the Phyllobates terribilis, and the toxin of a single frog of these two species could potentially kill upwards of 1,000 mice, with potential to kill a human (if sensitive to its toxins). Myers, C. W., and Daly, J. W. A dangerously toxic new frog (Phyllobates) used by Embera Indians of Western Colombia, with discussion of blowgun fabrication and dart poisoning. Bull. Amer. Mus. Nat. His. 161 (2):1–72. 1978. We should begin to correct the widespread bad reputation of these amazing frogs. To do so, I suggest we defer to the named used by a group of people who have known the natural history of these frogs far longer than the scientists who coined the name ‘poison frogs’. The Amazonian Peruvians call their native dendrobatid frogs ‘painted frogs’. A name which suits an incredibly diverse group of animals, that would earn the adjective ‘painted’ among the many spectacular sights of the Amazonian rainforest. I have worked with over 100 species of painted frogs, including thousands of individuals during the last 15 years and I never had any negative reaction. Nor have any of my dozens of collaborators, field assistants or colleagues. Are Captive and Imported Frogs any danger? This is where misinformation is rampant. First, unlike the frogs and toads in your backyard, dendrobatids do not innately make any of the toxins they have in their skin3. They acquire their toxins, called alkaloids, from a very specialized diet of ants, millipedes and mites, that themselves feed on a special diet of rainforest fungi and plants found in their natural habitats4. Whereas, captive dendrobatid frogs feed on pet store diets of non-toxic fruit flies, crickets, and springtails. Because of this, NO captive dendrobatid frogs possess any alkaloids and therefore, they pose absolutely NO risk to humans. This includes all frogs born in captivity and those taken from the wild, with one important exception: wild caught frogs of the genus Phyllobates. Given their extreme toxicity, wild caught frogs should always be handled with caution, as they can retain their toxins for up to two years after removal from the wild5, 6. Notably, the three true ‘dart’ frogs have not been exported as wild-caught frogs in almost 25 years. Thus, unless illegally collected, there is no chance anyone will encounter a wild Phyllobates ‘dart’ frog outside of their native habitat. Again captive bred Phyllobates frogs are completely safe. When laboratory-reared dendrobatid frogs are fed fruit flies dusted with laboratory grade chemical alkaloids, the chemicals can accumulate in the skin and remain active for months6. Nonetheless, all these frogs needed to be continuously fed alkaloids for 6 months before captive frogs display toxicity comparable to their wild cousins6. The types of chemical alkaloids used in the previously mentioned experiments are dangerous and they are not freely available to the public. Further, when poison frogs are fed North American ants, they do not accumulate toxins6. Captive frogs do retain the capacity to become toxic, but the sources of these toxins are not available to the public. In addition, accumulating toxins is a is lengthy process, taking up to half a year of deliberate feeding, so, any accidental consumption of these rare alkaloids will have no measurable effect on frog toxicity. My colleagues and I have come to recognize that captive poison frogs play a very important role for conservation. These tiny gems serve as ambassadors to the plight of the world’s declining amphibian populations and also, to the plight of our incredible tropical forests. Captive dendrobatid frogs are a tangible connection to tropical rainforests, which are being lost at an alarming rate. To conserve our most precious habitats and species, requires the support and political will of biologists, politicians and the public alike. With proper care, painted frogs are charismatic tropical ambassadors that can live right in our living rooms while posing no threat to humans. I sincerely hope that these important stewards continue to inspire people to learn more about our rainforests, and perhaps, motivate them to protect these fragile places. -Daly, J. W., S. I. Secunda, H. M. Garraffo, T. F. Spande, A. Wis nieski, and J. F. Cover, Jr. 1994. An uptake system for dietary alkaloids in poison frogs (Dendrobatidae). Toxicon 32:657–63. 5Myers, C. W., and Daly, J. W. 1978. A dangerously toxic new frog (Phyllobates) used by Embera Indians of Western Colombia, with discussion of blowgun fabrication and dart poisoning. Bull. Amer. Mus. Nat. His. 161 (2):1–72. -Barthalmus, G. T. 1994. Biological roles of amphibian skin secretions. In Amphibian biology. Vol. 1. The Integument, ed. H. Heatwole and G. T. Barthalmus, 382–410. Chipping, New South Wales, Australia: Surrey Beatty and Sons. -Bowie, J. H., K. L. Wegener, B. C. S. Chia, P. A. Wabnitz, J. A. Carver, M. J. Tyler, and J. C. Wallace. 1999. Host defence antibacterial peptides from skin secretions of Australian amphibians. The relationship between structure and activity. Prot. Pep. Lett. 6:259–69. -Clark, V. C., C. J. Raxworthy, V. Rakotomalala, P. Sierwald, and B. L. Fisher. 2005. Convergent evolution of chemical defense in poison frogs and arthropod prey between Madagascar and the Neotropics. Proc. Natl. Acad. Sci. USA 102:11617–22. -Caldwell, J.L. 1996. The evolution of myrmecophagy and its correlates in poison frogs (family Dendrobatidae). J. Zool., London 240:75–101. -Daly, J. W., and C. W. Myers. 1967. Toxicity of Panamanian poison frogs (Dendrobates): Some biological and chemical aspects. Science 156:970–73. -Daly, J. W., R. J. Highet, and C. W. Myers. 1984. Occurrence of skin alkaloids in non-dendrobatid frogs from Brazil (Bufonidae), Australia (Myobatrachidae) and Madagascar (Mantellinae). Toxicon 22:905–19. -Daly, J. W., H. M. Garraffo, and T. F. Spande. 1993. Amphibian alkaloids. In The alkaloids, ed. G. F. Cordell, 185–288. San Diego: Academic Press. -Daly, J. W., S. I. Secunda, H. M. Garraffo, T. F. Spande, A. Wisnieski, C. Nishihira, and J. F. Cover, Jr. 1992. Variability in alkaloid profiles in Neotropical poison frogs (Dendrobatidae): Genetic versus environmental determinants. Toxicon 30:887–98. -Daly, J. W. 1995. The chemistry of poisons in amphibian skin. Proc. Natl. Acad. Sci. USA 92:9–13. -Daly, J. W. 1998. Thirty years of discovering arthropod alkaloids in amphibian skin. J. Nat. Prod. 61:162–72. -Myers, C. W., and Daly, J. W. 1978. A dangerously toxic new frog (Phyllobates) used by Embera Indians of Western Colombia, with discussion of blowgun fabrication and dart poisoning. Bull. Amer. Mus. Nat. His. 161 (2):1–72. -Myers, C. W., and Daly, J. W. 1983. Dart-poison frogs. Sci. Amer. 248:120–33. -Preusser, H.-J., G. Habermehl, M. Sablofski, and D. Schmall-Haury. 1975. Antimicrobial activity of alkaloids from amphibian venoms and effects on the ultrastructure of yeast cells. Toxicon 13:285–89. -Saporito, R.A., Donnelly, M.A., Hoffman, R.L., Garraffo, H.M., and Daly, J.W. (2003) A siphonotid millipede (Rhinotus) as the source for the spiropyrrolizidine oximes of dendrobatid frogs. Journal of Chemical Ecology 9(12):2781-2786. -Saporito, R. A., H. M. Garraffo, M. A. Donnelly, A. L. Edwards, J. T. Longino, and J. W. Daly. (2004). Formacine ants: An arthropod source for the pumiliotoxin alkaloids of dendrobatid poison frogs. Proc. Natl. Acad. Sci. USA 101:8045–50. -Saporito, R.A., Donnelly, M.A., Spande, T.F., and Garraffo, H.M. (2012) A review of chemical ecology in poison frogs. Chemoecology 22: 159-168. -Toledo, R. C., and C. Jared. 1993. Cutaneous adaptations to water balance in amphibians. Comp. Biochem. Physiol. 105A:593–608. -Toft, C. A. 1995. Evolution of diet specialization in poison-dart frogs (Dendrobatidae). Herpetologica 51:202–16. -Zasloff, M. 1987. Magainins, a class of antimicrobial peptides from Xenopus skin: Isolation, characterization of two active forms, and partial cDNA sequence of a precursor. Proc. Natl. Acad. Sci. USA 84:5449–53. About the author: Dr. Jason L. Brown a poison frog researcher at The City College of New York. He has spent over three years in the field studying and observing tropical amphibians, traveling much of Central and South America. His research has focused on understanding the behaviors and taxonomy of Neotropical poison frogs. His interests in poison frogs existed before his academic career due to poison frogs in terraria, and continue to deepen with his growing knowledge of their seemingly endless colors, complex mating, parental care and social behaviors. During his academic career over last decade, he has published over 37 peer-reviewed scientific manuscripts, including descriptions of 11 poison frog species. Dr. Brown co-founded Dendrobates.org, a website dedicated to the systematics, first-hand observations and conservation of poison dart frogs. Dendrobates.org has been at the forefront of a campaign to promote a responsible and sustainable pet trade, focusing on widespread apathy regarding illegal, wild-caught amphibians.